Get 8 weeks of metabolic workouts using ZERO equipment PLUS 39 Finishers you can plug in with YOUR favorite workouts and save 86%! 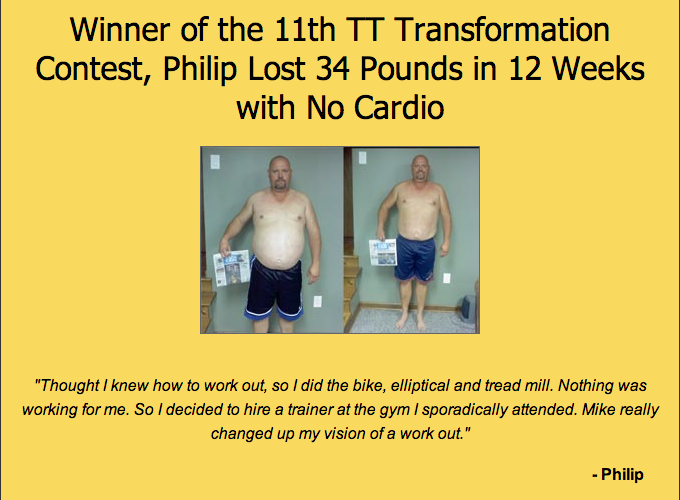 Today, I’d like to share the truth I’ve discovered while helping my clients dominate their transformation contests, winning a combined $4,500. I’ll also tell you my story of losing 105 pounds of ugly fat, including 14 inches of belly fat. But first, on this very page, I’m going to show you one 4-minute trick that has recently beenPROVEN to be far more effective for fat loss and chiseling muscle than 30 minutes of long, boring cardio. Yes, this 4-minute trick is better than 30 minutes of long, boring cardio. And of course, you have already tried a million different workout programs including increasing your boring cardio. And in the 2000’s, the fitness world introduced interval training. But you’re bored with that, too. …Because I’ve done the very same thing. There’s no sugar-coating it. I was freakin’ fat… as in 300 lbs. I wore 46″ pants and XXXL shirts. I was miserable and grouchy all the time. It wasn’t fair to my family and friends and I soon realized it was MY fault. On a cold December day in 2002, I was playing Madden on the playstation and I threw an interception. Out of frustration, I threw the controller down. Once I bent down to pick it up, I had an “A-ha” moment. I realized I was not the person I was meant to be. As athletic as I was throughout my life, I had led myself to this… a grouchy, overweight guy in his twenties letting life go by. I struggled as I reached down to pick the controller up. This was ridiculous as I huffed and puffed. I sat there on my couch, in shock, wondering what had happened to me. I was so athletic through my entire life, yet here I was, sweating from picking up a dang controller. I struggled just to get up and down the stairs or carrying more than two bags of groceries… in my twenties. It didn’t help that my breakfast was an iced honeybun with soda, along with supersized meals at lunch and huge bowls of ice cream and pizza for dinner. I never counted, but I wouldn’t be surprised if my calories were in the 8,000 to 10,000 range EVERY DAY. A desk job didn’t help either, along with the inactivity. I was literally ashamed of the guy in the mirror and knew I had to do something about it. That “epiphany” moment was a BIG SWITCH for me. I had enough, and I was going to do something about it. Just like everyone else, I hopped on the New Year Bandwagon, but understand this – I was going to follow through, unlike many other people. I was going to see my goal to the very end or die trying. This was it. Here’s the deal – I was going on vacation in a little over 6 months. My goal was to lose 50 pounds by vacation time. Any more than that would just be a bonus. This was aggressive, but I knew I could do it if I had the right mindset. Much like you, I knew I was going to either do this or not – there was no “I’ll give it a shot” mentality. I poured sweat, breathed heavily and was exhausted after just minutes. This was going to be harder than I thought. Finally, after minutes of struggling, I had put on my shoes. I drove to my old high school with a strong sense of urgency and anticipation. I walked towards the track with an agenda against my own belly fat, got out of the car and made my way towards the track. Memories of trying to lose weight before started to enter my head, giving me MORE doubt. I had already tried pouring myself into doing cardio for days on end. I had also tried numerous diets and would have a small victory after one to two weeks, but then I would fall right back into my old ways because the dieting was just too hard. Another trainer even gave me specific workouts where I would go to the gym 5-6 days a week and it certainly worked. I would lose 5, 10 sometimes 15 pounds, but then the reality of committing to something like that week after week set in and again… another failed attempt. Luckily for me, I had thought about Michael Jordan saying he “failed” hundreds of times, missing the shot to win the game… and that is why he succeeded. That still resonates with me to this day. I knew if I kept going, kept scratching and clawing my way, I could make a permanent change and rediscover who I used to be, the leaner much happier Mike Whitfield. “No more, EVER again” was my mentality. I wasn’t going to just “eat better and exercise”. Much like you have decided, I went into battle against my body fat and won… with a vengeance. And YOU can win, too. 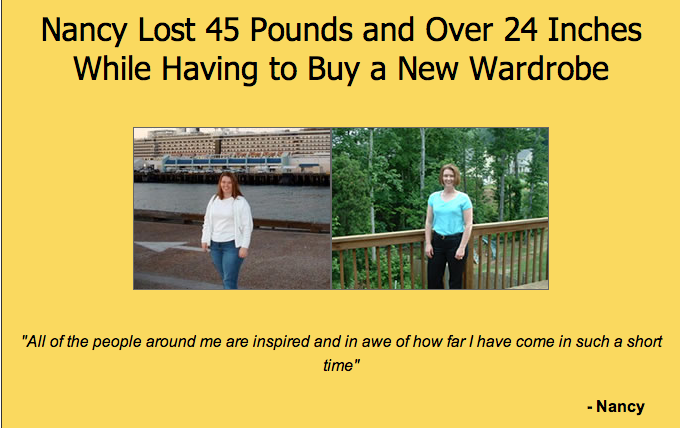 In fact, I lost 75 pounds in just 6 months! Since then, I’ve lost ANOTHER 30 pounds, bringing the total loss to 105 pounds and 14 inches of belly fat. Yes, I lost another human being. 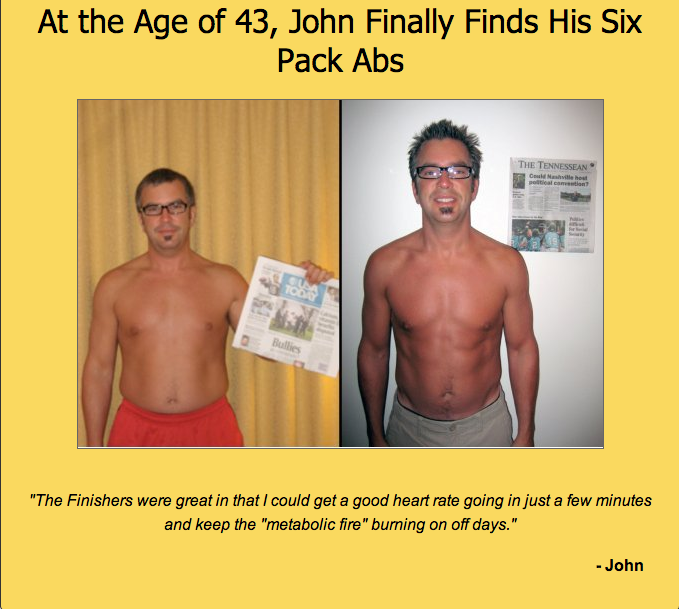 But I’m not the only one to experience a dramatic transformation using these insanely effective fat burning workouts that I still use years later – workouts that today’s leading fat loss experts are consistently using on their clients to help them burn fat even faster. 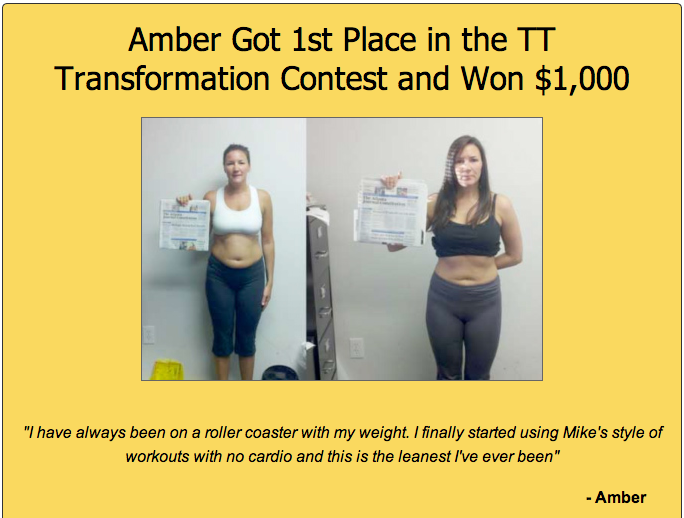 In fact, scroll down and you’ll see a few of my training clients who have gone on to win a combined $4,500 in the Turbulence Training Transformation contests. You see, for some of you, my workouts will just be too freakin’ hard, too mentally exhausting, and too different from mainstream thinking… And so if that’s you, I’m sorry, but I can’t help you. Just stop reading now. There’s a reason this trick lasts only 4 minutes. It’s very intense. So, if you’re not ready to step out of your comfort zone, don’t even bother attempting this 4-minute trick. Do the following circuit as many times as possible in 4 minutes, resting ONLY when needed. When the clock hits 4 minutes, you’re done. As you can see, this unique and addicting finisher requires ZERO equipment and kicks the pants off of boring cardio (yes, even intervals). I’m sure you would agree that if you could get the same, if not BETTER results in 4 minutes compared to 30 minutes of long, boring cardio, you would use this bodyweight finisher tool to get leaner and more chiseled, all while increasing your conditioning, which would improve everything in your life. Imagine smoking your lifting sessions and getting up and down the stairs with less effort, but more importantly, being able to play with your kids at THEIR level. And finally, the Bodyweight Finishers training used by Group B also resulted in greater overallworkout enjoyment. Let me be clear before you even think about starting this program. When you plug in these bodyweight finishers with your program, you better give it all you got. Because if you want lean and chiseled muscle and burn off even the most stubborn fat once and for all, you’ll have to give these bodyweight finishers everything you got. That’s why they are called “Finishers”. 13 Twenty-Ten Bodyweight Finishers – Using the cutting-edge 20-10 method, you’ll discover 13 mind-blowing and challenging bodyweight finishers. You’ll be asking for mercy as you push through 20 reps or seconds followed by a brief 10-second rest period… or worse yet… another 10-second or 10-rep exercise. It’s a NEW twist on the 20-10 approach you’ve never seen. 13 Density Bodyweight Finishers – The concept is simple, but the finishers are not. It’s you against the clock. This addicting method is easily the Finishers Fans favorite method… like the “Density Super 6″ and “Metabolic Deuce” Bodyweight Finishers. You’ll see some of the craziest set and rep schemes ever to chisel your body in this manual You’ll discover sets of 2 reps, 10 reps, and more with different time variables to keep it fun, yet effective. 13 Gauntlet Bodyweight Finishers – Take a deep breath before you go through the bodyweight gauntlet finishers. You’ll need to prepare yourself mentally as you go through these brutal, yet lethal finishers against belly fat. You’ll discover client favorites like the “Fine 9″ Gauntlet Bodyweight Finisher. One exercise will be assigned as the “Gauntlet”, and will challenge you to your core. Bodyweight Switch – What happens when you combine the power of metabolic conditioning and strength conditioning in insane but addicting supersets? Discover this inside the Bodyweight Switch program that is packed full of strength and conditioning supersets. You’ll bring a whole new stimulus with this approach and you’ll have fun burning fat doing it. You’ll get a FUN done-for-you system that you literally plug in with YOUR favorite workout programs. Take a nice deep breath and get ready to finally transform your body, but more importantly, your mind (and have fun doing it!). 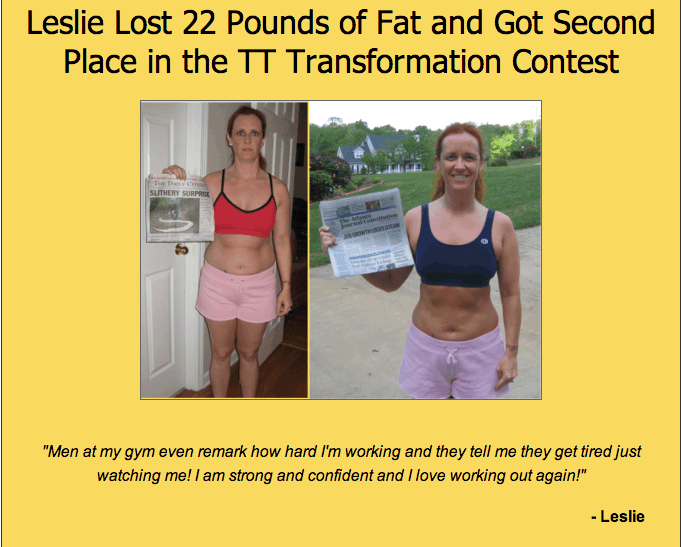 I’m sharing the same EXACT methods I’ve shared with my clients who have won a combined $4,500 in transformation contest money without ANY long, boring cardio. In fact, if you were to hire me to personally train you one-on-one using my metabolic resistance training programs and bodyweight finishers for 8 weeks at 3-4 days per week, you would be looking at investing up to $3,200. And when sold separately, the total value of these metabolic finishers specifically designed to be used with ZERO equipment and metabolic resistance training programs is $149.95. But with this special offer for you, you can get EVERYTHING you see above for just a fraction of that for a limited time. Alright, it’s time to get chiseled, have fun and of course… with ZERO equipment. P.S. You have no risk and nothing to lose but ugly pounds of stubborn fat. If you are not 100% satisfied for ANY reason, I’ll promptly refund every single penny. P.P.S. If you are hesitant on investing yourself and committing to this kind of effort, you are not ready and I completely understand. Like I said, you MUST already be motivated to transform your body AND mind. If you have any questions about the Bodyweight Finishers program, please email me at support@workoutfinishers.com. Although a response is given much sooner, please allow 48 hours for a reply. Q: Can I use the Finishers as my primary workout? A: These are best used immediately after YOUR favorite workout program, however they can be used as quick and efficient workouts for when you are short on time (they are intense!). PLUS, you have the benefit of not having to use any equipment. These are also great off-day workouts. For the full workouts, use Bodyweight Switch and the Bodyweight Dirty 30, which are included in this special offer. Q: Some bodyweight programs require a pull-up or chin-up bar, stability balls and more. Are these really ZERO-EQUIPMENT workouts? A: My promise to you – absolutely ZERO equipment required. You don’t need ANYTHING. Q: Are Bodyweight Finishers just for men, or can women do them, too? A: Bodyweight Finishers are a great tool for both men and women who want to lose fat or get rid of boring cardio (even intervals), without sacrificing muscle and a lot of time. A: You will receive instant access where you can download your product in PDF format. You can start in minutes! Q: What if I don’t know an exercise? A: Don’t worry, you get photos and exercise descriptions of all the exercises in the manuals.